Chaturanga Dandasana sounds like an interesting side dish at your favorite tapas restaurant or an odd little dance you could try on a Saturday night. In any flow or vinyasa-based yoga class, it is a little dance used as a transitional movement or pose on your way to downward facing dog. It’s quick—happening in one short breath. The challenge: to understand and execute this foundational pose in a short time while keeping joints aligned and safe. I have had the fortune and misfortune to work with an excellent physical therapist in the Seattle area. Over the years, he’s put me back together from both athletic injuries and basic mishaps. (Not all yogis are so coordinated off the mat!) He’s taken the time to work with me on both shoulders—giving tips and explaining concepts which I slip into my classes from time to time. The elbows are too far away from the rib cage making the shoulders less stable. As we lower our bodies from plank, there’s a tendency for the elbows to go wide–away from the body. It’s hard to squeeze those elbows in.. but we need to for stability! Shoulders are most stable in 3 specific places of abduction (Abduction = moving the arms away from the body. Think of arms lifting in a cartoon of someone being abducted by aliens! ): 0 degrees (arms by your side), 90 degrees (arms straight out from the body either to the side or flexed–like plank), and 180 degrees (arms overhead in line with the shoulders). In chaturanga, we are moving from 90 degrees to 0 degrees (arms straight out from the body or flexed to arms by your side). If 0 degrees provides the most stability for our endpoint, we want the elbows tucked tight against the body in the brief end hold before moving on. 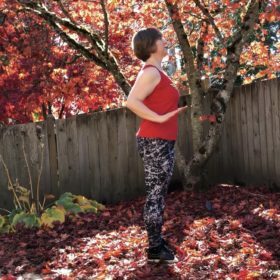 Elbows in the middle of your side body—higher than you want to be! Elbows are too far back putting the shoulders in extension. As we lower down, it’s hard to see where our elbows are in relation to our side body. Typically, we lower down too far to maintain shoulder stability. 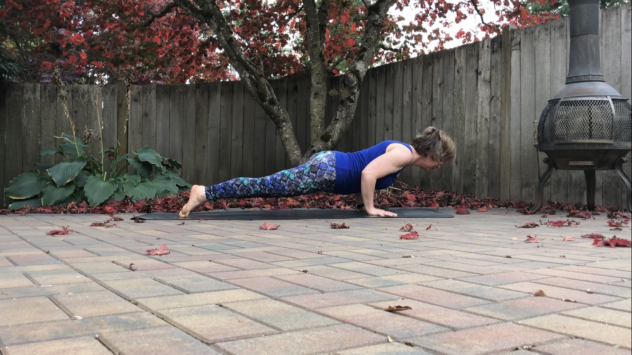 If our shoulders are stable at 0 degrees of abduction, then the elbows align directly with the shoulders on the sides of our bodies at the “bottom” of chaturanga. They don’t extend beyond the middle of the rib cage. Take a look at the image below with my elbows in line with my shoulders: neutral. Avoid taking the elbows beyond the middle of the ribs—it’s too low to qualify as safe and stable. Come to standing with your arms beside your body. 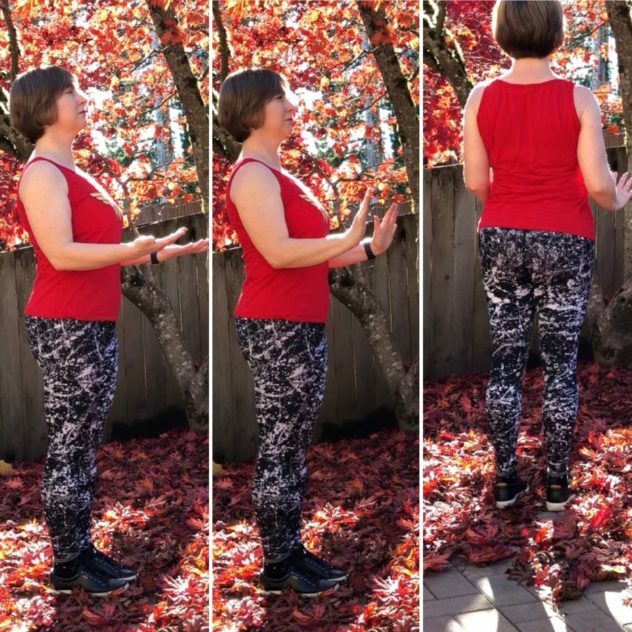 Bend your elbows with your palms facing up …as I say in class, “Like you brought a delicious platter of pastries!” Imagine that those pastries weigh quite a bit; hug your elbows in tightly to put structural stability into your platter hold. Keep the 90-degree bend in your elbows as you turn your palms forward.Excellent!! This is the end position. 1) Bend elbows and turn palms up like holding a platter. 2) Turn palms forward and squeeze elbows in. 3) Elbows are centered from front to back of the body. Want to explore how to turn this standing alignment into action? 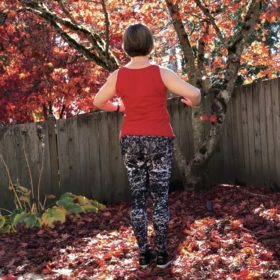 Come check out my Chaturanga Checkup Workshop on 12/3/17 from 12:30 pm to 2 pm at Root2Rise Yoga Studio in Woodinville. We’ll go over these theories, put them into practice and explore ways to build strength to maintain this alignment.